Yurting is a great way to introduce your kids to camping and the great outdoors. As our elevation increases we climb from juniper and sagebrush desert and into an alpine forest of blue spruce pines and quaking aspens. The temperature drops by ten degrees and we turn off the A/C and roll down the windows so we can take in the fresh smell of the pine trees. 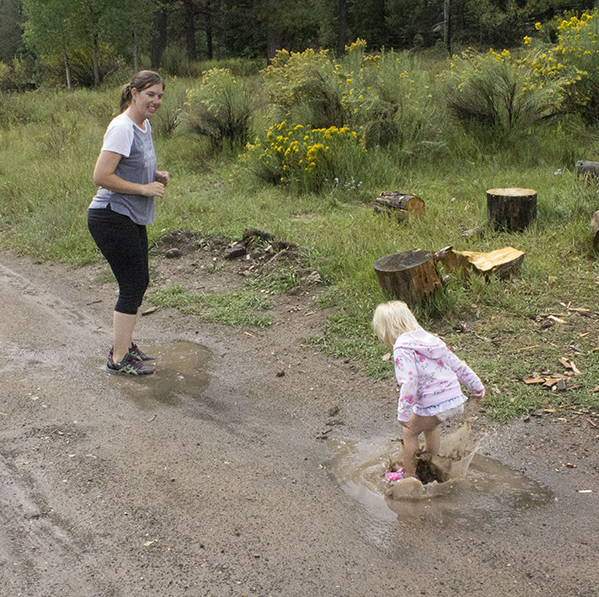 My wife points out three mule deer walking through the forest and points them out to our two-year-old daughter who raises her head from the car seat so she can see them. “Those are deer, “my wife tells her. A few miles later we turn off the gravel road onto a two-track dirt road and about a mile farther we see our destination: A very isolated yurt, deep in the woods. And it’s all ours for the next four days. I had a great childhood filled with lots of camping, fishing, hiking, hunting and tramping around outside with my friends, my dog and my wild family. As a family, our first camping trip of the year occurred at Easter and we spent it in the desert; sometimes at the San Rafael Swell, sometimes at Lake Powell and during the year’s first outing I chased lizards, butterflies, squirrels and rambunctious cousins. The next big family trip came in July when our family traveled to Flaming Gorge, Utah where I climbed trees, fed peanuts to chipmunks and played in the fragrant duff of the forest floor. Sometime during the summer, we always took a family camping trip into the woods near our home where, as a kid, I sat motionless in the scratchy, mountain grass watching deer graze, listened to summer hail crack on the roof of our camper, and fell asleep to the sound of my parents whispering in bed at the same level of the camper’s propane heater. The absolute best camping trip of the year occurred at the end of October during deer hunt where the chill of the high-mountain woods competed against the heat of a blazing campfire while we listened to my dad and uncles tell hilarious stories from their adventurous youth. Most of my favorite memories from childhood are from family camping trips and whether I was chasing lizards across sandstone, walking through an alpine meadow filled with wildflowers, sitting in a boat on Lake Powell watching the sunrise paint the cliffs shades of vermilion, pink and peach, I had the wonderful privilege of feeling the sun on my face, the wind in my hair, and bare, unpaved ground beneath my feet. And that rare delight of campfire heat kissing my sunburned face, what I would describe as the most luxurious burn. During it all I developed a great love and appreciation for the outdoors, for nature and the numerous strange, wonderful creatures that inhabit the different landscapes we visited. Having emerged from such a rich background, immersed in nature, curiosity, adventure and exploration, I now want the same for my own daughter. I want her to have a childhood that’s also filled with camping, fishing, hiking, exploring, discovering and tramping around outside. I want her to be awed by a star-filled sky, by starling murmurations and the sight of a thousand dragonflies flying over the surface of an alpine lake. I want her to know the joys of listening to stories both tall and true told around a campfire. I want her to feel at home in the woods, in the desert, on a lake. I want her to know how to operate a Jeep, a raft and a boat. I want her to have an interesting, adventurous, discovery-filled life so that she too will have some interesting stories of her own to tell around her campfires of the future. That’s where the yurt comes in. For those unfamiliar with yurting, a yurt is a circular, canvas walled tent with a wooden floor which are about 20 feet in diameter. 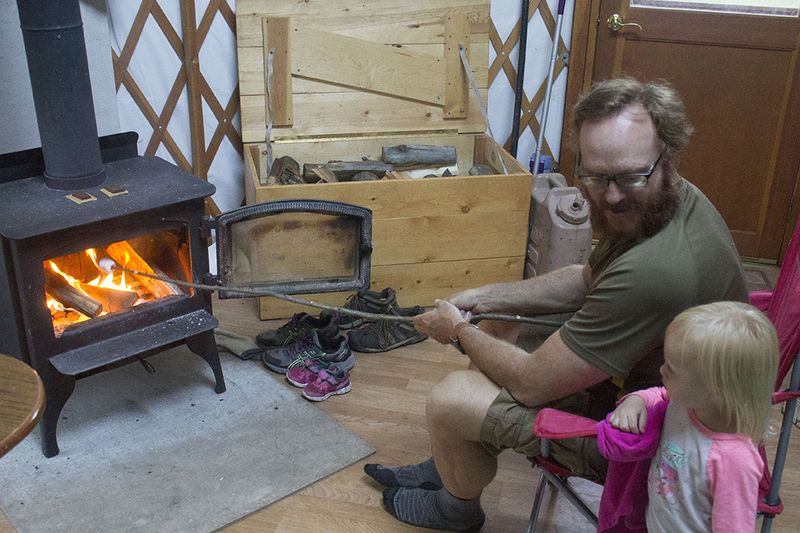 The U.S. Forest Service, which maintains most of the yurts in Gateway country, provides most of the gear you’ll need for your stay including propane, lanterns, cook stove, wood stove, beds, wood, axes, pots and pans. Pretty much everything but bedding and food which the camper will need to provide themselves. All yurts also have an outhouse, located a short distance away. The U.S. Forest Service prides itself on locating their yurts on some of its most pristine and scenic land. The best part about yurting with a Forest Service yurt is that you have the location to yourself. You’re not in a yurt, next to a yurt, next to a yurt. Another great thing is they locate their yurts in secluded locales where there is ZERO cell phone reception. I appreciate that a lot. It’s nice not having your fellow camp mates checking their phones all day long. The yurt is the perfect combination of roughing it and comfort. After a day spent fishing or hiking it’s very nice to ot have to crawl into a cold, cramped tent and sleep on lumpy ground. I want my daughter to grow up with happy camping memories and a desire to do more of it in her life when she becomes an adult, so to that end I don’t want her to associate camping with an uncomfortable, unhappy, scary experience. But neither do I want to take her for an outing in the woods and then drive into town and check into a hotel. I don’t want her to think camping means checking into a hotel at the end of the day. That’s one of the things that makes camping in a yurt so great. You can be warm and comfortable and still feel like you’re camping. 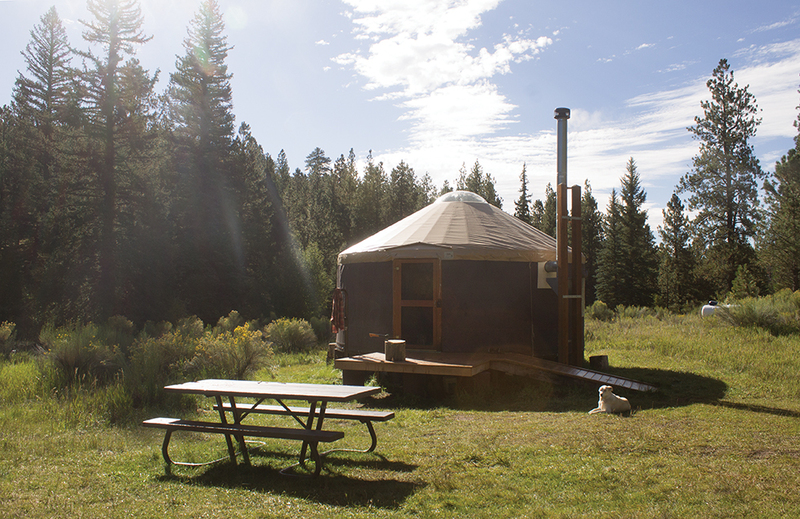 Yurting is glamping meets wild, open public lands which you have all to yourselves. It is pretty much the perfect way to camp. My wife and I chose a yurt located in an alpine meadow in southern Utah. The nearest people are in a town 20 miles away. I park the Jeep in front of the yurt and we spend the next ten minutes carrying our food and bedding into the yurt and arranging it for our stay.And then it’s time to explore! We walk out the door and take in our environment. Our yurt for the next four days and three nights, sits in a grassy alpine meadow. A narrow stream, with elusive native brook and cutthroat trout, runs through the meadow just 50 feet from the yurt. Aspens and tall pines border the meadow on its north and south sides. This is our daughter, Roo’s, first time camping. So, we let her lead the way. She heads straight for the stream. The stream is only a car lane wide and eight to 10 inches deep. She wades right into the cold alpine water. 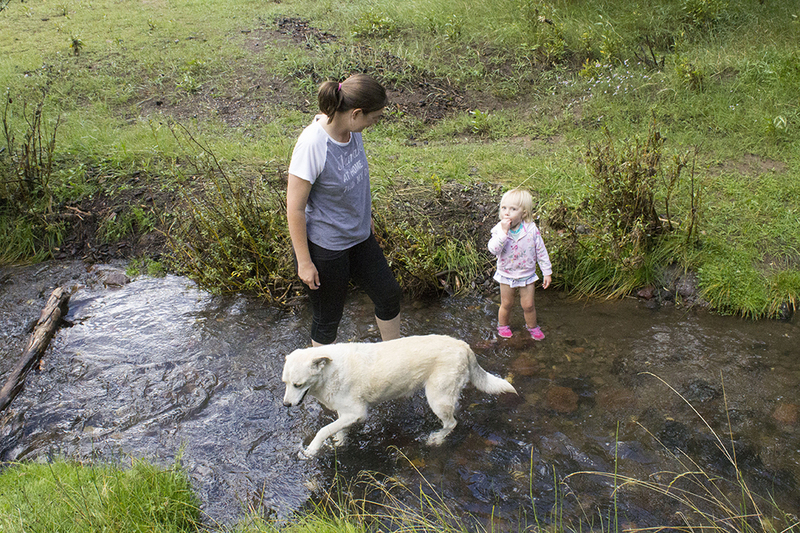 My wife and I wade in beside her and from there we continue walking down the stream following Roo’s lead. A few minutes later our feet are freezing and we exit the stream and move out onto the meadow where Roo finds and inspects flowers and butterflies. We live in Page, Arizona. Land of heat and sand and short, scrubby vegetation. All this grass, trees and greenery is new to her and she is enthralled by it. In the coming days we’ll visit an alpine lake and watch a family of ducks and iridescent dragonflies flitting through the swampgrass in three to five-foot long banners. In the evenings we’ll cook our meals over the yurts propane stove and heat it with its wood-burning stove. On the second and third nights we’ll be treated to night time thunderstorms that arrive shortly after we go to bed and we’re allowed that rare luxury of listening to rain pitter pat on a canvas roof. Wonderful! We splashed through rain puddles, walked down paths, gazed at the stars and roasted marshmallows and made plenty of hot cocoa. I don’t know how much my two year old daughter will remember from this trip – possibly nothing – but somewhere in her psyche, subconscious or neural pathways I think we embedded and/or imprinted some happy sub-memories that as she grows older, she’ll associate with camping, family, nature and the amazing creatures that inhabit it.